Blueberries are synonymous with summer, so it is fitting that July is National Blueberry Month. And, there are so many ways to enjoy this amazing little super food; from blueberry muffins and jams, to the more traditional blueberry pie or cobbler. But, if you’re looking for something a little different, you’re in luck! 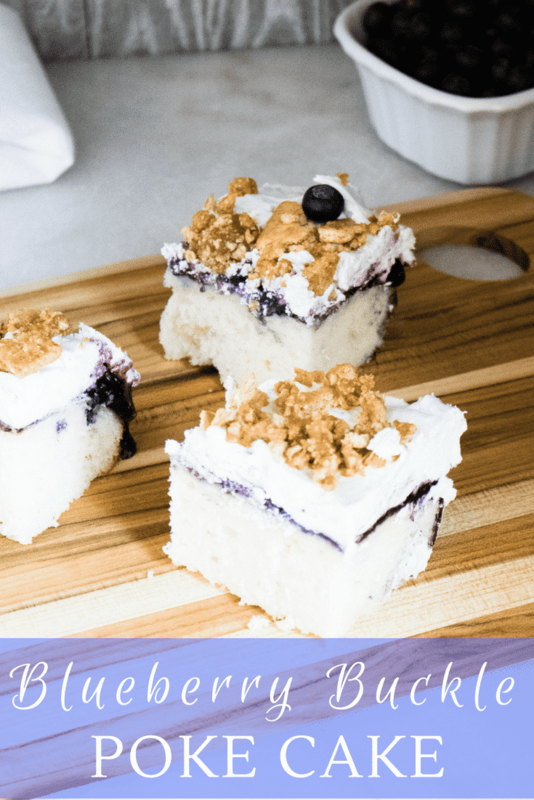 This Blueberry Buckle Poke Cake is a fun, new twist on a quintessential summertime dessert. And it’s a breeze to make, which makes it the perfect choice for all your summer celebrations, barbecues, potlucks and picnics. 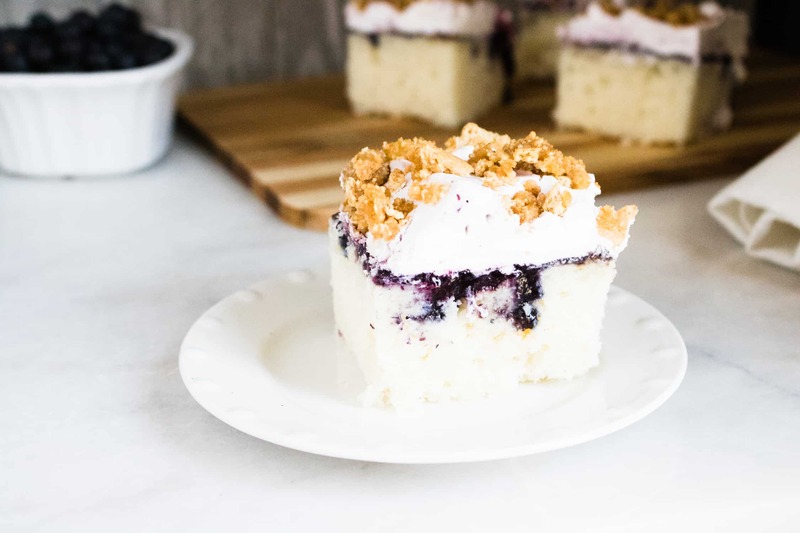 This recipe combines light and airy white cake with sweet, yet slightly tart blueberry pie filling and a crunchy streusel-like topping to give you all the great flavors of a blueberry buckle, packed into a festive, fun and crowd-pleasing poke cake. Poke Cake was invented by the Jell-O Company in 1969, as a way to increase their product sales. 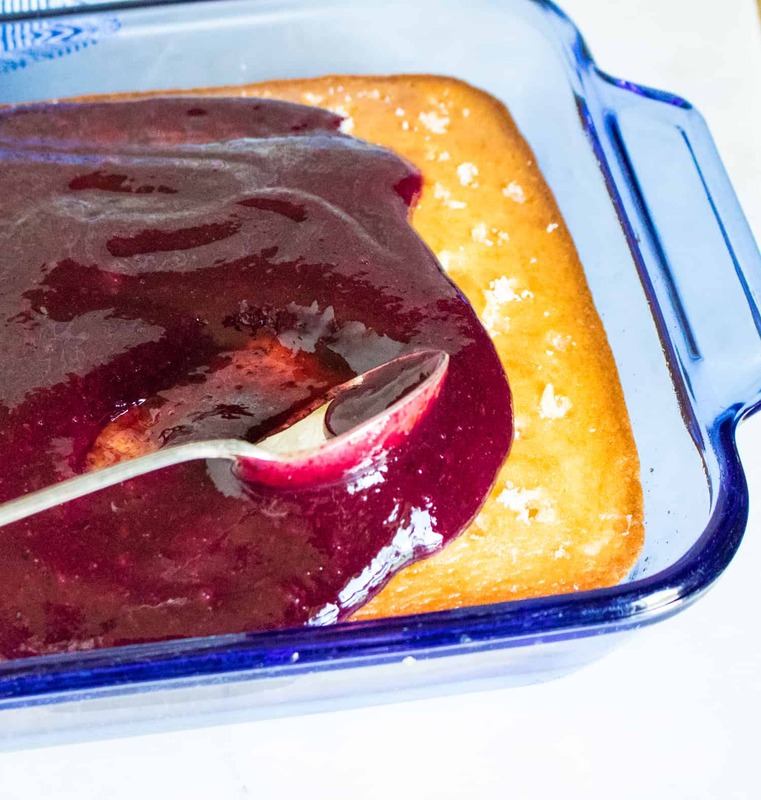 The original version was made by baking a white sheet cake, poking holes with a fork all over the top of the cake, and then pouring strawberry Jell-O all over the top of the cake, allowing it to fill the ‘poked’ holes. 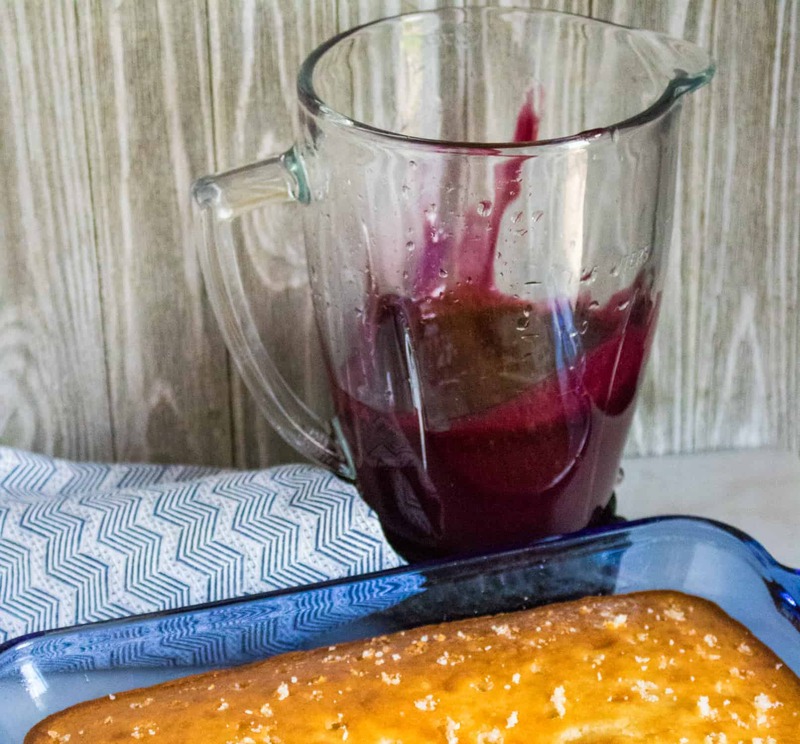 Bakers are now moving beyond gelatin and filling poke cake with everything from flavored syrups, chocolate, and caramel to coffee, cocktail mixers and fruit purées. What is the Difference Between Buckle, Cobbler, and Crisp? Blueberry Buckle is a moist fruit cake with a streusel topping, whereas a cobbler is baked fruit topped with a batter or biscuit crust. A fruit crisp (sometimes called a crumble) is also baked fruit, but with a streusel-like topping made of flour, nuts, oats, butter, and sugar. 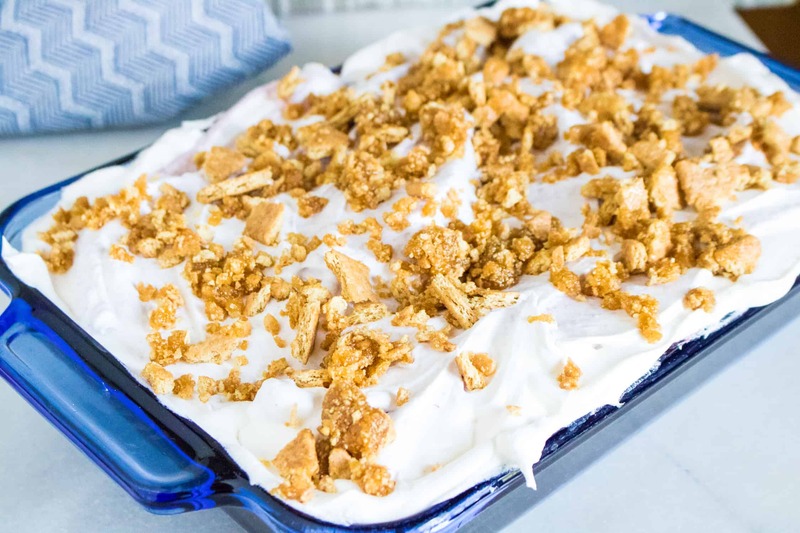 Blueberry Buckle gets its name from the fact that, once baked, the top takes on a buckled appearance. Bake cake in 13×9 pan according to package instructions. Allow to cool. Using a wooden skewer or the end of a wooden spoon, poke holes in the top of the cake. Then, in a blender, liquify the blueberry pie filling. Next, pour the blueberry filling over the cake, using a spoon to work it into the holes. Top the blueberry filling with whipped cream. When it’s time to serve, top with additional blueberries, if desired. Enjoy! 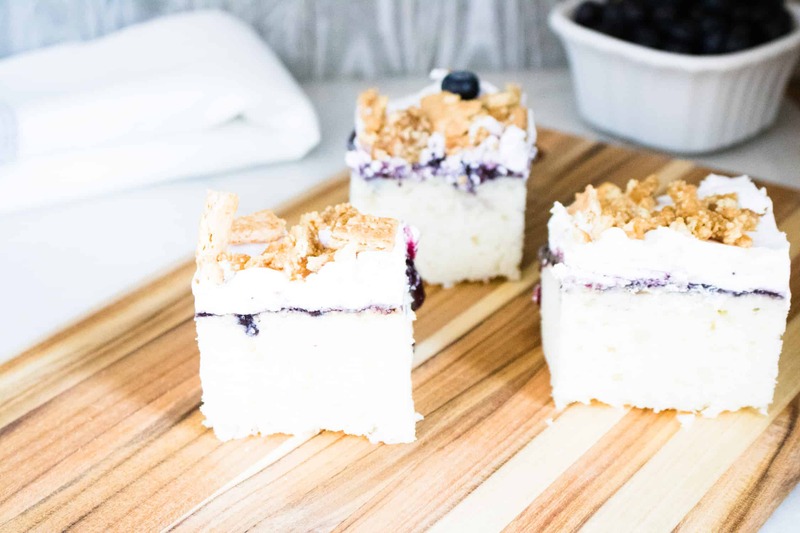 Blueberry Buckle Poke Cake is a fun twist on a quintessential summertime dessert.